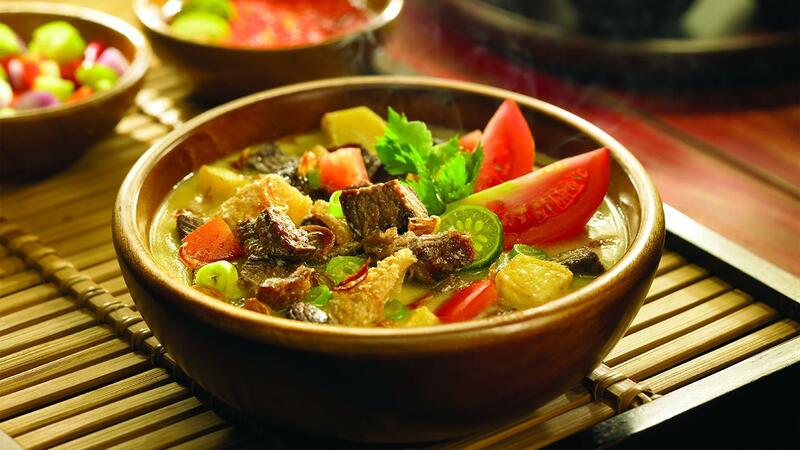 A hot bowl of beef coconut milk soup that warm your customer up. This Jakarta's traditional soup full of processed meat and offal that mixed with various spices will create an unforgettable dish for your customers. Briefly boil a beef and offals in cold water until the dirt out. Then dispose the dirty water and change with new cold water. Put back into the pan, add some water, white spice and the other spices, stirring stew-tos to evenly spices. Once the sauce are boiled reduce heat, add the Royco Beef, pepper, sugar, and coconut milk, leave the beef and the offals tender. Once tender remove the offal and beef and then fried until brownish. Cut small squares offals and then put in a small bowl, add tomatoes and fried potatoes and pour the hot chicken-broth. Serve with: white rice, lime, emping and sambal.